In a world that's predominantly populated by meat-lovers, sometimes I wonder how vegetarians can survive especially when it comes to eating out. I have friends who have been vegetarians all their lives and I'm really amazed at how creative they are in the kitchen. In fact, their food looks mouthwatering and definitely not so sad at all. While I have a long way to go in being able to fully accept all types of veggies, at least I do appreciate a wide variety of leafy and non-leafy veggies and I think, at this point, that's good enough. One thing that I love about vegetables is the light feeling that I get after each meal. While I know I can't live life without meat, I do not enjoy the heavy, guilty feeling that I would get after munching on 2-3 pieces of fried chicken or after finishing even half a slab of ribs. Thus, I would allow myself to take a day off and go all-veg for some sort of "detox" once in a while. Anyway, a few weeks ago, I had lunch with a couple of fellow bloggers at Pita Pan at the top floor of The Shoppes @ Marina Bay Sands. Paul and I have visited this restaurant before to buy some of their falafels to take home. We loved it! It's made of chickpeas and all other veggies yet it was so flavorful and could definitely pass as a regular meatball. Pita Pan is a vegetarian restaurant serving Mediterranean dishes. In addition to being vegetarian, all their menu offerings are dairy-free too. That is just perfect for lactose-intolerant people like me! That day, we got to sample a few more dishes as well as their newest offerings. Let me share them with you! Let me start with one of my favorite appetizer -- hummus. 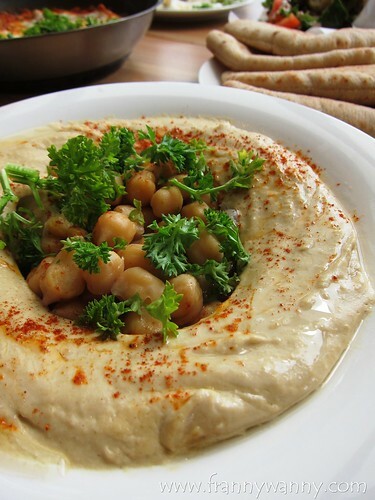 This is a very simple yet full-flavored dip made of chickpeas, tahini, lemon juice and garlic. I have been planning to make this at home actually but if I can get a ready-made one which is so yummy from Pita Pan, maybe I should reconsider? ;) Anyway, I love having this with pita bread where I would break the bread and dip it into the hummus. Wonderful creamy texture and the consistency was spot on. Another must try at Pita Pan. 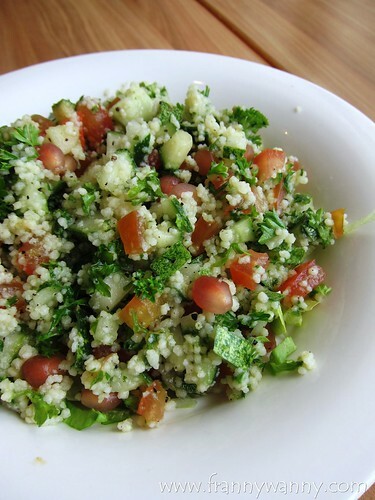 It's a very light yet tasty salad of Bulgur wheat, chopped parsley, tomatoes, cucumber, mint, lemon juice and olive oil. For some reason, I love mixing this with a bit of hummus which I find to tastes really good! 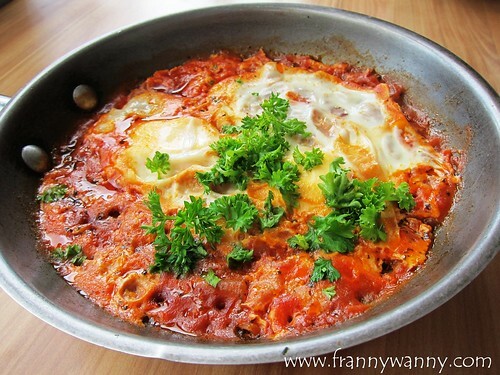 This is a pretty skillet dish made out of two poached eggs on a bed of ragout spicy tomato sauce, onions, sweet pepper and served with some pita bread. Not bad but I'm not really a fan of tomato sauce so I just had a little bit and focused my attention on my favorites that day. I arrived a bit late so I wasn't able to catch the initial briefing. 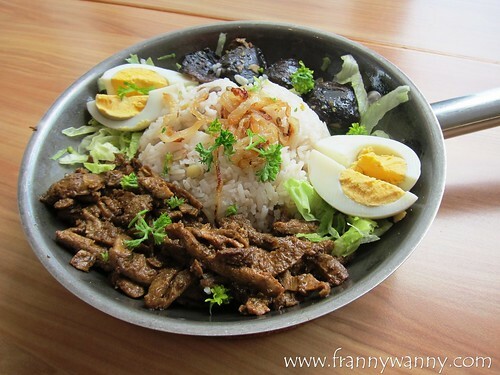 So when this dish came out, I initially thought that it was real beef shawarma. It was only until I had my first bite when I realized that something was different. It was good but definitely it wasn't beef. Great news for the veggie-lovers though as this is purely meat-free as they use mock meat instead. Admitedly, the taste was a bit different so some of us loved with while the others don't. Served with lentil rice, mushrooms and boiled egg, this would make a great lunch choice for those working within the vicinity. This is Pita Pan's signature item and it's similar to a Persian shawarma wrap. The beauty of this menu item is you can definitely customize every bit that goes inside the pita pocket. First step is to choose your filling -- from falafels to all vegetarian or SABICH which is a mixture of boiled egg and eggplant. We went for the falafels option and chose up to 5 toppings and dressings. Tadahhh! Here's our finished product. It was so good particularly because we asked for more creamy white garlic sauce. Yum yum yum! 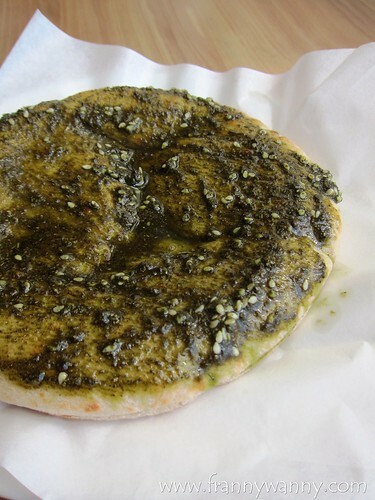 For those who wants more than the usual plain pita bread, I recommend trying the one with za'atar seasoning as it has a very similar taste to pesto. I may have a bit of an acquired taste so do give it a try and see if it's something you'll like. 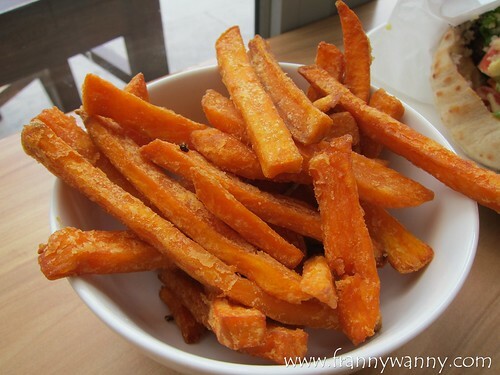 We also got to try a bowl of sweet potato fries which sadly wasn't crunchy anymore. Nonetheless, if you love sweet potatoes then you'll love munching in this together with your pocket meal. 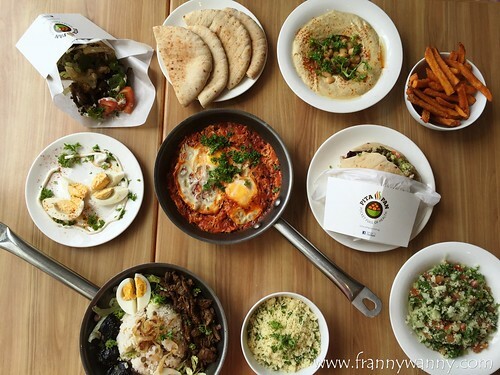 I got to admit that I have been seeing Pita Pan whenever I'm at Marina Bay Sands for the past 3 years and I never really thought of giving it a try until that day when we decided to order their falafels. Aside from their winning falafels, I would now gladly go back for more of their hummus and pocket meals. Whether you're a vegetarian or not, this is definitely a good place to eat your greens. 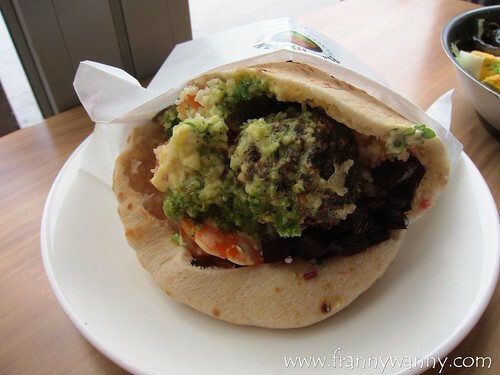 Pita Pan is located at 2 Bay Avenue, L1-87, The Shoppes at Marina Bay Sands, Singapore 018972. They also have a second outlet at The Venetian in Macau. Interesting!